Dan's students can get information from Dan to access his library of more than 160 Novice Nook articles from the last fifteen years. The articles can be accessed by those with a link students get from Dan to the Google Drive Folder. The Novice Nook, and all Chess Cafe, hyperlinks (below) will only take you to Chess Cafe if you are not a Chess Cafe member. If a student still can't access the Novice Nooks for some reason, contact Dan for a workaround to access the old Novice Nook files from Chess Cafe. A Counting Primer* - scroll to the bottom of this page to see the correct first diagram on page 3. Also, in the 2nd diagram on p.3 the White King is on g1. Introductory video on Safety & Counting. A Decade of Novice Nook - Highlights the past 10 years via the book "A Guide to Chess Improvement: The Best of Novice Nook" - take link inside column for sneak peek at the book. A Guide to P-R3* - Honorable Mention, "Best Web Instruction" 2005 There should be a black bishop on e7 in the first diagram; scroll to the bottom of this page to see the correct final diagram on p. 7. A Tactics Quiz - from a reader: A. Torrecillas: "I tried; 93 seconds for all 12 correct results, that means 2394; actually I'm 2389"
Activity is the Real Goal - not "space" or "development"; At the end is a "four parallel lines" chart about criticality. See also this similar but shorter Thinking Cap. Anders' Game - includes a detailed discussion of a position where it is not correct to win the exchange - honorable mention "Best Analysis"
Annotated Game Collections vs. Instructive Anthologies - - There's a big difference between types of annotated game books and helpful they are for improvement. Another example here. Attack it with Something Worth Less - E. Weaver wrote: "Your newest Novice Nook is one of the best I've seen! I seem to be missing AWL's in my calculations too often or not seeing them quickly enough..."
Break Moves: Opening Lines to Increase Mobility* - Correction note: first move after diagram on p.4 should be 3.cxd5, not 3.cxd4. 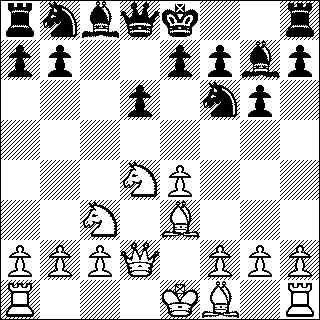 On p.6 "7.Be2 cxd4" should be "7.Be3 cxd4"; on p.7 remove the third black knight at b8. Combining Motifs - Email from Ernie: Dan, I would give this NN a "chessical" double exclam!! This is the kind of stuff that can really help us to become better analysts! Don't Know What to Do? Try Dan's Dirty Dozen - chessbuzz Manny tweets: "This could be the best #chess article I have ever read" - winner, 2012 CJA Award "Best Instructive Lesson"
​Evaluation Quiz - see also Evaluation Criteria - For a good example of how the bishop pair is better than a ruined pawn structure, see Ivanchuk-Nakamura Bilbao 2011. Correction note: In solution to #3 should be "Black's doubled rooks on the e-file..." and "Black might be able to plant his knight on e4..." In solution to #4 "This is certainly the most “tactical-looking” of the eight positions." Examples of Chess Logic - "Misc NN #3"- includes my best-ever (but advanced) composed problem on page 5. Correction note: On p.5, line b White's 2nd move should be 2.Kf6, not 2.Kf7. Excerpt: Looking for Trouble - one of my favorite books. The idea for the book was suggested by Dr. Rolfe, who wanted to identify and deal with threats better. Going to Sleep in the Endgame "GTS"
Hendriks, Thought Process, and Improvement - Some observations and comments about Move First, Think Later. Improving Analysis Skills - the most important chess skill! King + Pawn vs. King* - (A follow-up to this NN starts on page 6 of the July '04 NN) - in the paragraph "Now suppose Black had played it wrong..." the move numbers are one too high. Learning From Dr. de Groot - CJA 1st Prize, Best Web-based Instruction 2003-2004! My Top Tips for Chess Improvement - They are all here in one place If you want to read only one Novice Nook. . .
Novice Nook Quiz - a great review of many of the concepts found in these articles; In #36 the question should read "...the 1st part of the 1st step..."
Nunn, Chernev, and Learning Chess - Should Dr. Nunn's criticism of Logical Chess Move by Move stop you from reading it? Includes the mini-topic "Practice as if it is a Meaningful Game"
Odds and Ends - lots of good stuff here! - Misc #4 (also: Techniques; A Fistful of Lessons, Examples of Chess Logic) - includes "don't pawn grab when ahead" game. Before the final diagram there are two sets of "move 15" so starting with the 2nd set, all the move numbers should be one higher. Opening Principles* - Reader posts takeoff off my opening advice in this fictional dialogue. Also, email: Dan, It REALLY WORKS, not only that I don't need to waste my time to complicate problem, mobilizing your pieces early is simply the best option:) combine with some opening principles you taught me, I have not yet lost a game on ICC ... Thank you very much!! Position Dependent Ideas - includes pros and cons of capturing ...c5xd4 in The Advance French and ...Nbd7 combined with ...c7-c5 ideas in the King's Indian. Quiescence Errors* - what happens when you stop analyzing when there are still relevant forcing moves. GM Lenderman's advanced videos on quiescence errors at Chess.com. Note: In the 2nd diagram the white rook on e1 should be on d1, precluding the complications of 1...Nc2. Speeding Up - suffering from playing too slow and getting into unnecessary time trouble...? As a bonus, includes the critical idea: "The Two Things Necessary to Satisfy a Safety Issue"
Sunil's Rooks and Right Tackles - Do football players learn faster than chess players? The role of incentives in learning chess. The Curious Case of MrBoejangles - How did my most productive adult student gain so much so fast? The Endgame Bind - winner, "Best Analysis"
The Fun of Pros and Cons - Important for those who play too fast! Part 1 in a two-part series about Making Decisions (discusses the need to make decisions) - well received! The Fundamental Theorem of Safety and Activity - would you believe they are cousins? The Goal Each Move - You should know what this goal is! Correction note: In the final paragraph addressing the problem in Ward's The Improver's It's Your Move Black's 8th move and subsequent analysis is incorrect. Correct is "8.Kg6 Ke6! 9.Kg5 Ke5 10.Kh4 Kd4 11.Kg3 Ke5 The diagonal opposition is OK here since White cannot get behind Black’s King 12.Kf2 Kd4 13.Ke1 Ke5 14.Kd2 Ke4" with a draw. The Most Common Opening Inaccuracies - starts with 1.d4 d5 2.c4 Nf6(?) Marshall variation; 1st diagram p.3 both "5...axb5" should be "5...cxb5"
The Most Common Opening Tactics - typo: In the Riga variation line showing the Phantom Pin, after 7.Re1 the moves 7...d5 8.Nxd4 are missing before "7...Bc5", which thus should be "8...Bc5" etc. The Road to Carnegie Hall - about the importance of practice, balancing it with theory! The Room Full of Grandmasters - a follow-up to The Two Move Triggers Larry Wutt wrote: "I just finished reading "TRFOG" and LOVED IT. I am going to use the Trigger 2 exercise with my training partner in our next training game. I have intuitively used the two triggers, but never consistently. It's nice to have the ideas put forth in such a succinct and easily understood manner. I feel that following this advice will raise my playing strength by 100 points!" The Safety Status of a Piece - defines terms like attacked, en prise, inadequately guarded, overprotected, etc. The Safety Table - The 5th in the series on Counting: keeping track of basic safety issues - weaker students have told me they really feel this one helps them! The Self-Fulfilling Prophecy - your attitude strongly affects your play; in mental sports your mental outlook is critical. The Six Common Chess States - CJA 1st Prize, Best Instruction 2001-2002! The Three "Times" for Checks, Captures, and Threats - If you allow an opponent's tactic, is it due to lack of pattern recognition or thought process, or both? The Two Move Triggers - one of my favorite, original, and most important Nooks, about time management. - Great testimonials from two experts! Time Management Tales - Don't let these happen to you! Understanding Chess Puzzles - e.g. What does "Play and win" mean? When You're Winning it's a Whole Different Game* - e-mail from a student: "During the games somehow I managed to be up a piece by the mid-middle game (in each game) and then I really relied on your list of five things to do when you’re winning. It worked very well. I did catch myself several times wanting to ignore the 5 rules, but I stuck to the list and won every game. " The following should be the first diagram on page 3 of Apr 2002: A Counting Primer.